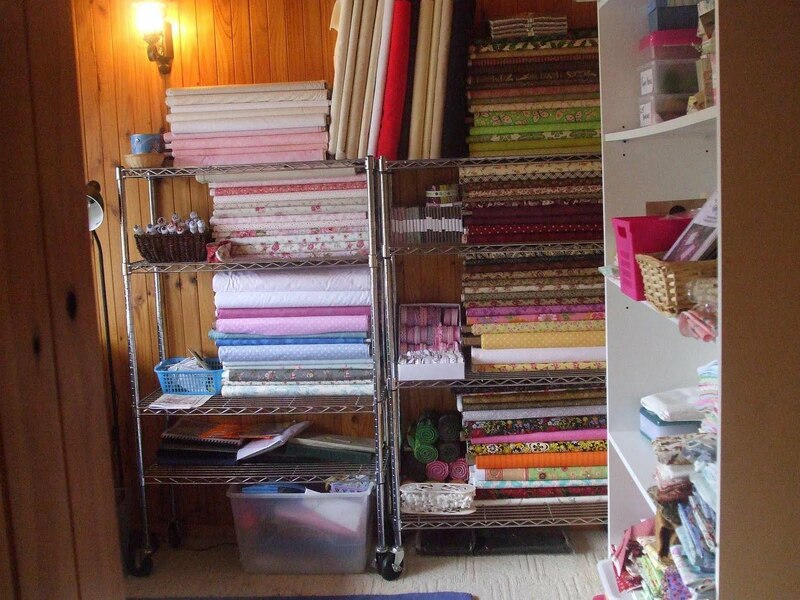 Fee's Little Craft Studio: New Stock, New Kit, A Birthday and the Studio has moved ! New Stock, New Kit, A Birthday and the Studio has moved ! Gosh it is only Tuesday but already I have had such a busy week it seems. Yesterday a big box of Moda Yumminess arrived in the form of some Rural Jardin Bolts and Fat Quarter Bundles, Jelly Rolls and Charm packs from the new Kansas Troubles range "Wrapped in Paisley" a very nice country coloured range. All are listed over at Ebay now. Guess who was 1 year old on the 10th March? MADELIENE !! Can you believe she is 1 already? She had a little birthday party on Sunday. My lovely friend Sandra made this gorgeous Tinkerbelle cake for her. 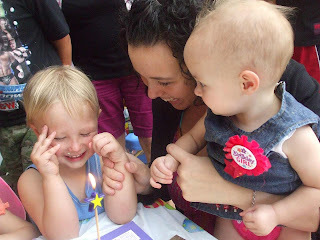 Here are both Tom and Maddie - Tom wanted to grab the candles - the little rascal....... He did blow the candles out for her though. 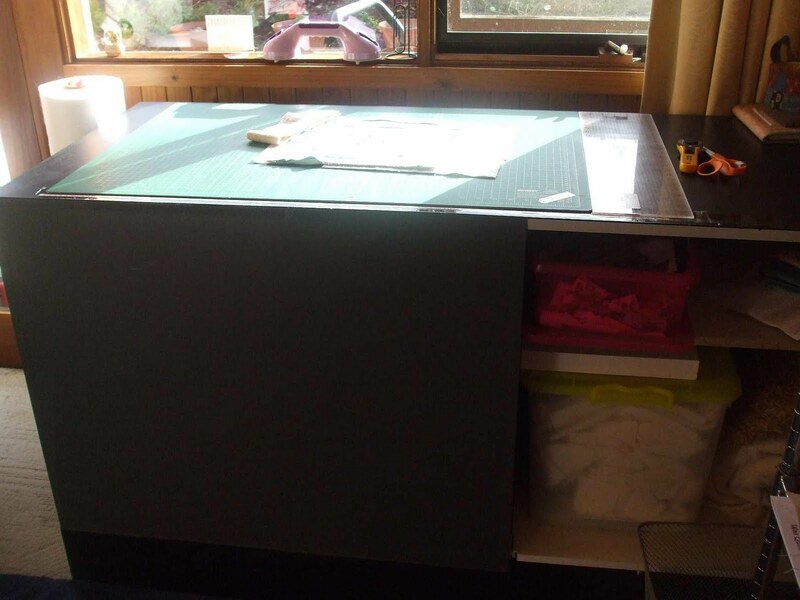 Mr MC was very helpful with moving everything but was a bit dismayed when I told him that I just had to have my cutting counter inside. It is a 3 man lift so he had to call in the cavalry to help. It is an old shop counter from the local post office and the perfect height for cutting. It is now under the window with the sunshine pouring in over it each morning. Bliss !! Here is my latest finish and my latest kit offering. It is "Precious Things" by Leanne Beasley. 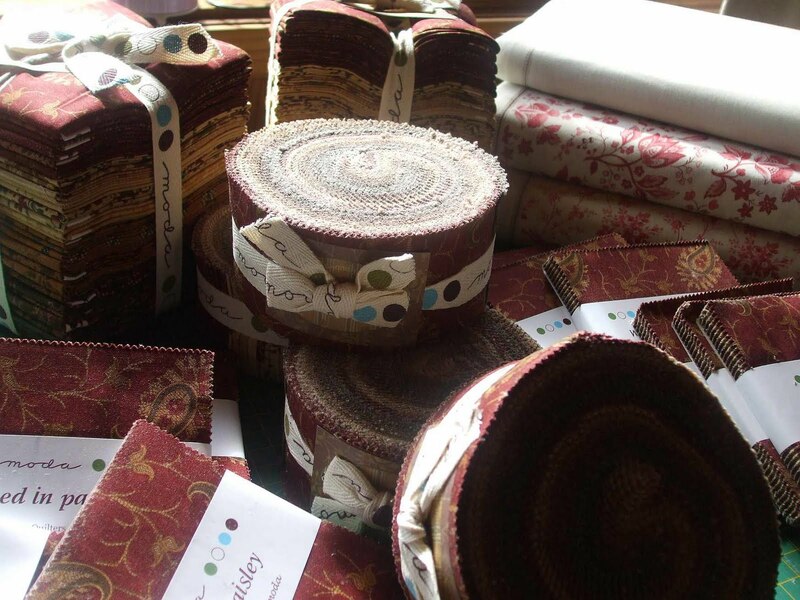 I have made it up in the kit fabrics so that you can see just how pretty it looks. Have you seen this design before? It is just so lovely and perfect for keeping your precious sewing things safe. 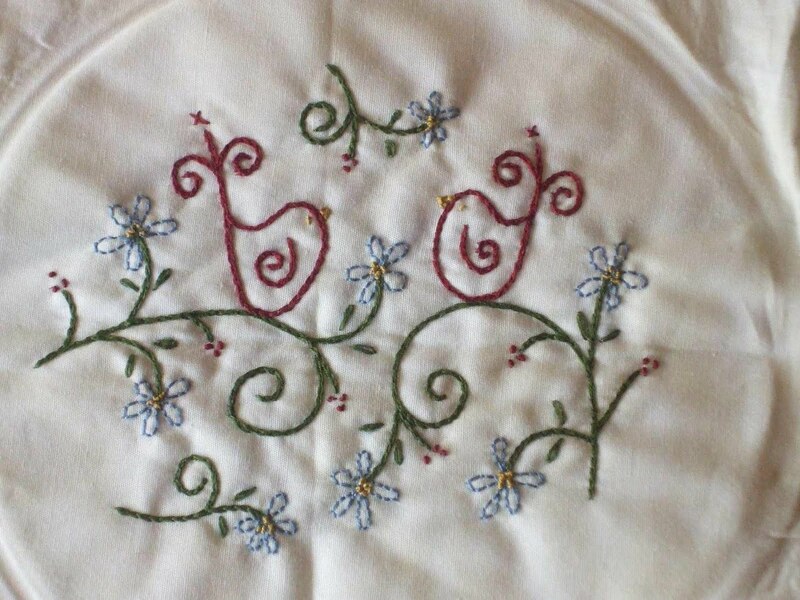 The kit is priced at just $32.00 which includes the pattern which you can use over and over again. Besides finishing the sample I have ben working on a variety of projects including this one which will be released very soon. A few of you have asked what I purchased at the gathering - Well here you go...... I promised myself that I wouldn't buy any fabric because as you can see from the previous photo's I do have quite a bit already. 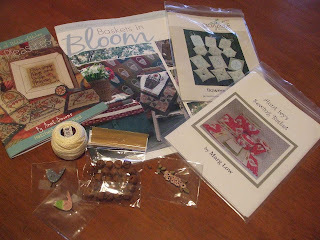 I did purchase some patterns, Perle Cotton, Rusty Bells and of course some Theodore Cleave Buttons. I am so much in love with those buttons that i have just placed an order with Barbara for quite afew of the ranges to be stocked in our store. 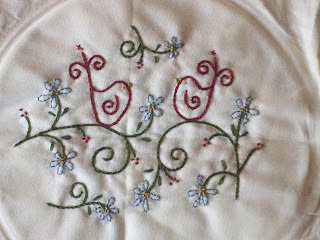 And the table runner from the gathering is progressing - This is the first stitchery and I am 1/3 of the way through the second one - Hopefully I will have it finished over Easter. 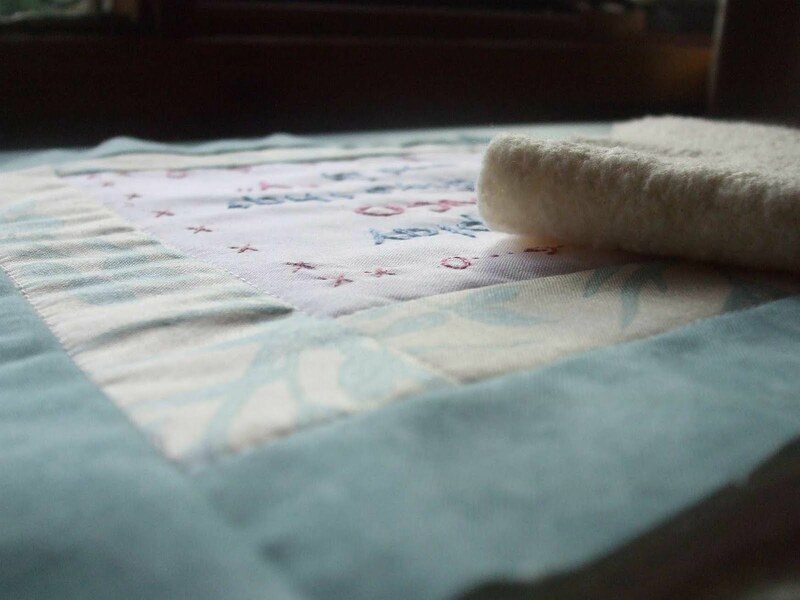 I know what you mean about stitching in the cold weather! You just want to be inside the nice warm house don't you? The Tinkerbell cake is so cute! Can't wait to shop at your place! Gorgeous things at your place. 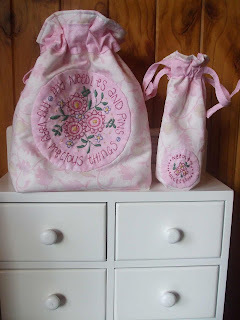 I have just finished the Precious Things bag...yummy! MMMM MMM MODA - what a lovely pile of goodies! 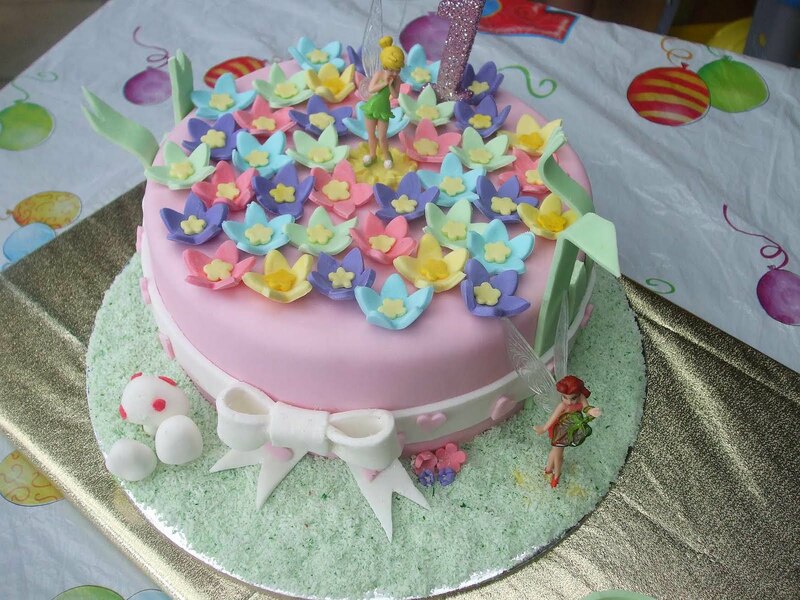 That Tink cake is too adorable - what a precious cake for a precious girl! Tom looks so sweetly mischievous. Good for you on moving your studio into the warmth of the house. My cutting table is also by the window - Fiona, do you find that your mat warps in the sun? Mine does, but straightens out slowly the rest of the day. Your cutting counter is wonderful. Love the precious things pattern, the goodies you bought, the table runner but most of all your sneak peek! Mmm - lots of inspiration in your sewing room - I think if I had access to that much fabric nothing would get done while I dreamed about all the posibilities. Beautiful project and super cute cake - lucky GD. Sandra did a beautiful job of the cake! I will be keep an eye out for your buttons! Oh your studio looks like such a lovely spot. That cake is so adorable.